Hi, Are (Ah-ray) here again, back with another blog. I was supposed to write it about a month ago, but procrastination is my middle name, so here we are. Some of you may know that I have been part of the Animation Roundtable at CEDEC for two years. We tried to apply again this year, but we didn’t make the cut sadly. I was honestly pretty upset at this, because I had hoped that the Animation Roundtable here would blossom into something similar to the Animation Roundtable at GDC. But CEDEC is a small event, and they want to vary the entries each year, so I think that’s why we didn’t make it in. A lot of the participants from previous roundtables are members of a Slack channel for animators that I made a couple years back. When I told them that we didn’t make it into CEDEC this year, they were very disappointed. Somebody joking said that we should just make our own roundtable. The more I thought about it, the more it seemed possible, so I decided to try. I, of course, needed a venue for the event, so I asked the big boss if we could use one of the meeting rooms here at AMATA. I was very happy that he obliged. I made a pretty lame Eventbrite page and posted it to the Slack channel. Then I waited for people to sign up. I was only expecting a handful of people to come, but in the end we had 24 participants(myself, and 3 other AMATA animators included)! I was absolutely floored at the turnout. If you’ve never been to one of my roundtables(and I’m sure most of you haven’t), they are a little different. I don’t really talk much. In my mind, the whole point of the roundtable is for the participants to talk with each other, so I am more of a Vanna White (only Americans will get that…) style MC; I just point at the next person to talk. I have anyone who has something they want to ask write a question on a post-it note, and we put them all on a whiteboard. 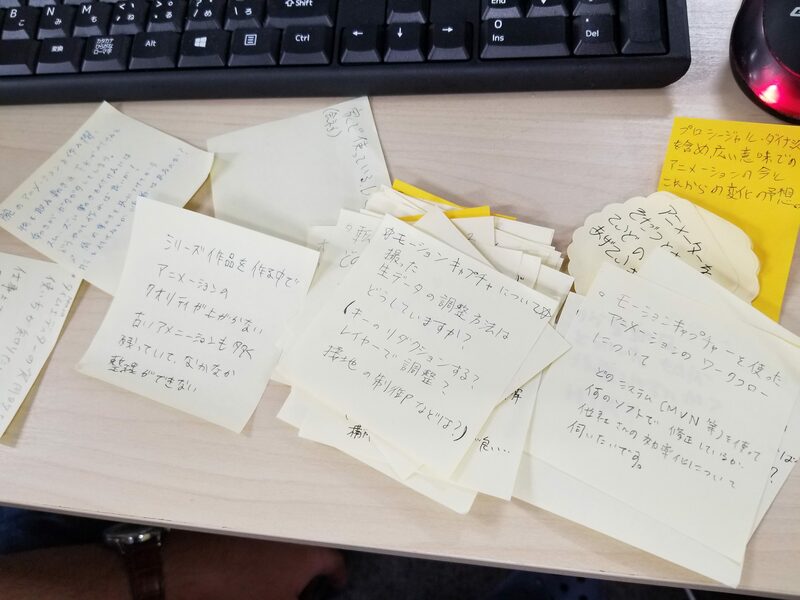 Then, I have my partner MC (who can actually read handwritten Japanese…) pick a post-it to talk about. We had a TON of different topics this time, ranging from “Where does an animator’s job start and end?” to “How do you train new animators?” to “How to communicate with staff, especially if their native language isn’t Japanese?” Even though there were less people than we have had a the CEDEC roundtable, I think we may have gotten more post-its! It was really cool to hear about how different companies and different people approach these subjects. I think everyone felt relieved to know that they were going through the same problems as animators from other companies. I can’t go into TOO much detail about what we talked about, because the things that were said were for that room’s ears only! If you want to know the juicy details, you’ll just have to come to the next one.